For the younger, more red-blooded EAW male (and for others who would never dare admit it) one of the attractions of working in a conflict zone will be the abundance of weaponry on display. All the weapons ever seen in films from Die Hard to Desperado will finally become an everyday reality. Invariably from Europe, where gun control is strictly enforced, the newly arrived EAW will play it cool and refrain from ogling the local army or militia’s firearms too much. Over time, a few pics will appear on Facebook featuring the EAW standing next to men with guns. These will progress to pictures where the EAW is actually holding a gun (although he or she will be sure to hold the gun ‘ironically’). Finally, our EAW will get that picture he or she is really after — the one where the EAW is firing a gun. Upon returning home, the EAW will be sure to let everyone know how nice it is to be back in a gun-free environment. Editors note: Please heed the following cautionary tale about posing with guns if you are planning to one day run an organization that claims to be liberating children from warlords…. Raises hand. Guilty of this one. Why does the guy that photo with the ANA look so familiar? 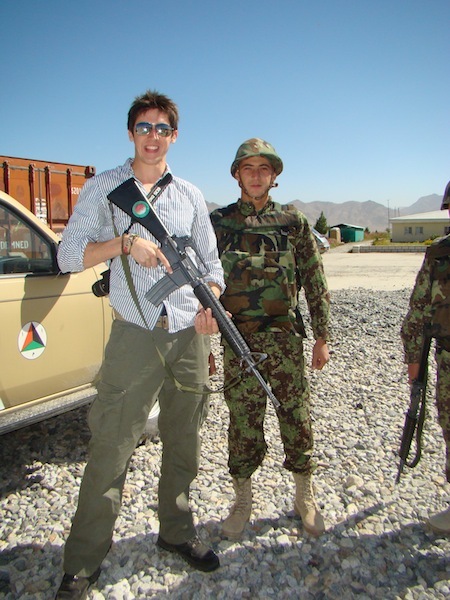 Is this something ironic, like posing with celebs, something that’s only acceptable if it’s done with verve and a witty Facebook status, or is it something that’s best done when leaning to the right while declaring that only warlords and ISAF can get the job done? I don’t have my photo yet (GNR/ISF/F-FDTL), and want to know if this is an activity appropriate for the newbie EAW – obviously it’s difficult to do the latter without sufficient field cred. Also, we need some guidance about which agencies are appropriate to work for while holding guns. Amnesty International? IFRC? Oxfam? Is it edgier if your organisation explicitly forbids fraternising with soldiers? You need to be in an actual conflict newbie :) Timor is holiday camp for the ISF and they know it. My test of a good EAW and gun pic would be ‘is this the pic the media are gonna run with when the scandal breaks?’. The imagery you need is something which demonstrates the soldiers and guns are a necessary part of the security support for your mission. I don’t think this one would cut it without an awful lot of photoshopping. First, the backdrop. Don’t make it so obvious that you’re inside the compound. I can’t see Joseph Kony anywhere. Second, the goofy grin. The idea is to look tough: take the lead from the military guy in the background. Only grin when there are dead or captive bad guys in shot. Third, far too clean cut. The meme is supposed to be macho. Grimy and bare breasted would be much better. Fourth, weapons handling. Finger off trigger and gun pointing down doesn’t really cut it. Look like you mean business. Point it at the bad guys, or the camera. Last of all, and I can’t emphasise this enough, NO CAMERA. You will look like a tourist; and no self respecting EAW will ever do that. I did like the Cartman sunglasses though. A nice touch, that. What do you mean “Upon returning home, the EAW will be sure to let everyone know how nice it is to be back in a gun-free environment”? So you aren’t returning to Virginia, Arizona, Texas …..